My exploits with steak on this blog have thus far been with Filet Mignon and Pepper-Crusted Filet Mignon. Those are really nice cuts of meat (also expensive) and hard to mess up I think. I needed a cheaper alternative to feed my carnivorous urges, so I turned to sirloin, which is less than half the price of filet mignon. I’ve actually grilled it before for a BBQ, but have since learned that making it on the stove/oven is just as easy. I think the most important lesson is timing and not over-cooking it, especially if you are like me, and prefer steak medium-rare. Remember you can always put it back in the oven to cook further, but you can’t un-cook it. This step is not necessary, but I think does help tenderize the meat. 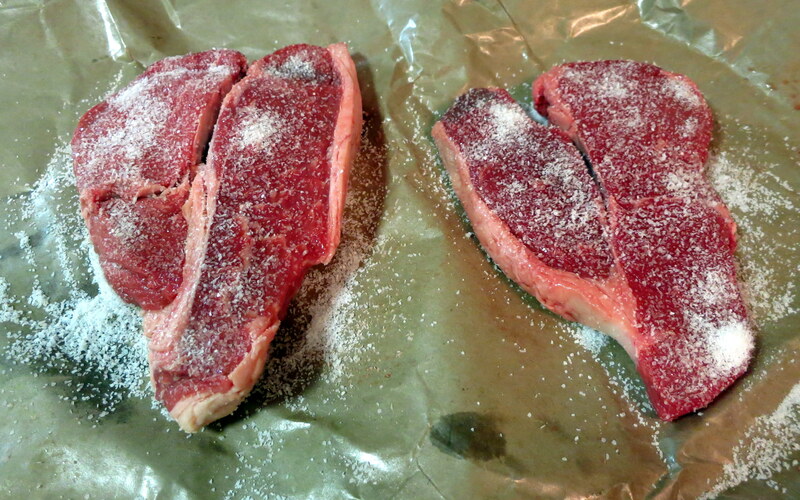 Take out your steak and cover generously with salt. I mean generously. You will rinse it off later, so don’t worry you won’t be eating salt for dinner. Let the salted meat sit for about an hour and then rinse off and pat dry. Don’t reuse the towel you are using for anything else though to prevent the spread of bacteria from the uncooked meat! Preheat oven to 400*F. Now salt and pepper the steak to your liking. Heat oil/fat to as high of a temperature as possible. I also like to add thyme to my pan at this point. 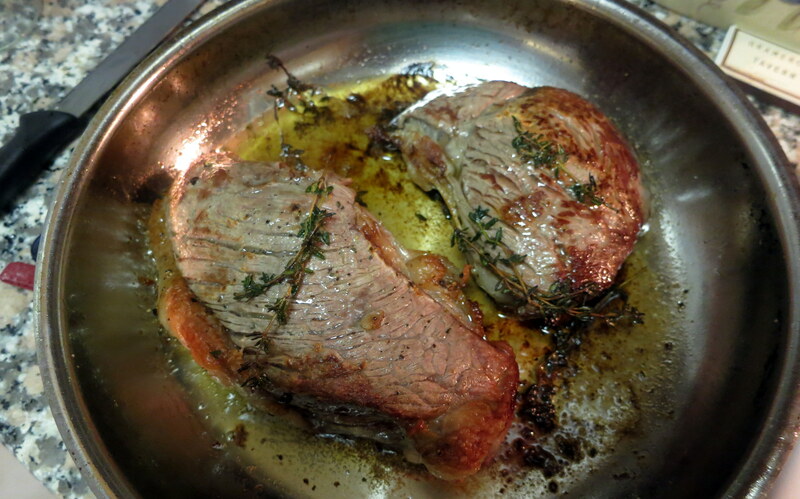 Sear the steak for about 1-2 minutes and then flip and let sear for another 30-60 seconds. 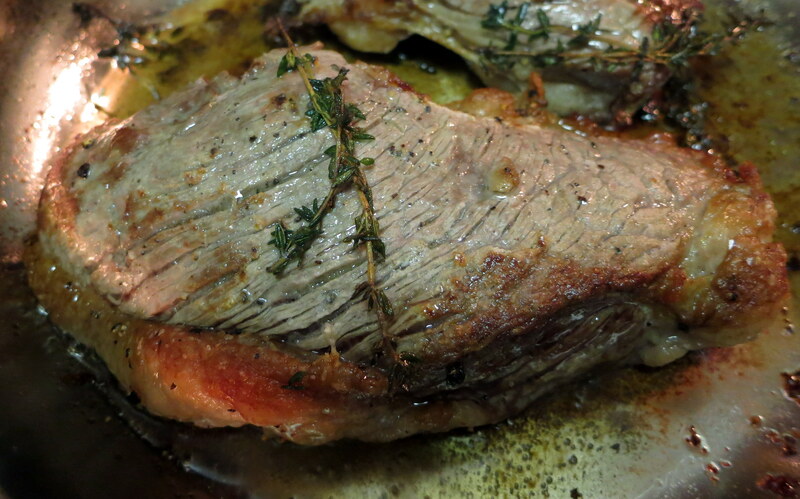 Place the pan in the oven and roast for 5-8 minutes depending on thickness of the cut and your preference for doneness. Take out of the oven and let sit for 5-10 minutes (don’t underestimate this step!). Serve and enjoy! Right now this steak with ehhs for breakfast…I am sooo hungry!